8:00 A.M. – A procession of three hundred student from Manoranjan-Sarojini Madhyamik School and Manoharpur Bandhab Binod Bihari Primary School along with their respective teacher and the well wishers of Manoharpur Sabuj Sangha has walked around 3km distance in entire village to spread the importance of Children Day. 9:00 A.M. – A general meeting was started by ex-head master of Manoharpur Bandhab Binod Bihari Primary School Sri Pradyot Kumar Santra by putting garland on the image of Swami Vivekananda as well as Pundit Jawaharlal Nehru. Then he recited some Vedic Chant to start. After that he requested to all student, teacher and well wishers to observe 2 minutes silent prayer for the children all over the world. After the silent prayer all teachers and guest deliver their valuable speech to create a proper environment for the children to develop themselves in right way. 4:00 P.M. – Bratachari and cultural function organized by the member of “Chaloman Bahini” of MSS. Today our seminar was stared through the thanks giving message to Ramkrishna Mission Vivekananda University, Belur Math, Howrah and OFFER to give us a space to conduct such auspicious programme by the secretary of Manoharpur Sabuj Sangha Sri Sandipan Santra. After that Sri Arunagshu Pradhan, Head Master of Shyamsundar Pur High School delivered his valuable speech on positive parenting. Also a beautiful speech was delivered by Sri Somshankar Bera, Convenor of Lokjagaron Ramkrishna Mission Loksiksha Parishad village development centre, Ms. Shukla Maiti, Gram Panchayat Member, Ms. Swapna Khara(Das), Head Mistress, Manoharpur Bandhab Binod Bihari Primary School. 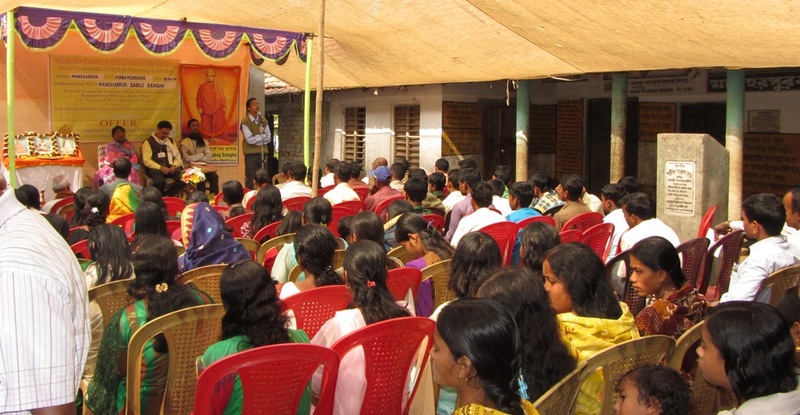 The seminar was attended by about 220 women from our village.